Shared Access Signature (SAS) authentication provides a simple and flexible option to authenticate requests to Service Bus. You can define access rules on the entire namespace as well as individual entities such as queues, relays, topics and Event Hubs. While this is also possible with ACS authentication, what sets SAS option apart is the ability to grant access to Service Bus entities without giving out keys. This is achieved by issuing SAS tokens (or signatures, although the actual signatures are just part of them) that are bound to particular authorization policies and have a finite lifetime. 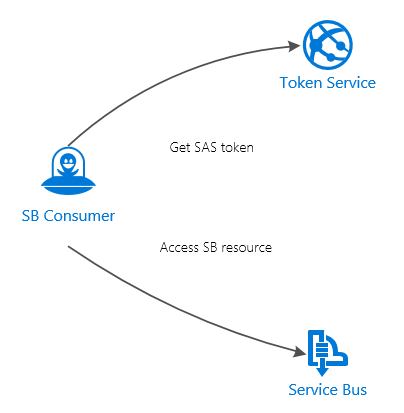 In addition to managing SAS token expiration a common requirement is the ability to revoke issued tokens to prevent further undesired access to Service Bus entities and make consumers undergo a procedure of requesting new tokens. SAS tokens include a signature which is a keyed hash (HMAC-SHA256) of the resource URL and the expiration period. By changing both primary and secondary keys of the authorization policy that is used for issued tokens we effectively invalidate these tokens. It is also recommended to implement rotation of SAS keys on a regular basis so that keys that have been compromised could not be used to access Service Bus. Primary and secondary keys allow us to implement rotation without affecting well behaving consumers. While the key that was used to generate a signature is present in either primary or secondary position the token will be successfully validated by Service Bus. It is recommended to use a primary key to generate tokens and during rotation replace a secondary key with the old primary key and assign a newly generated key to the primary key. It will allow tokens signed with the old primary key to still work if they haven't yet expired. How do token expiration and keys rotation periods correlate? It turns out the expiration period should not exceed the rotation one otherwise there will be a chance for a token to span over more than 2 rotation periods after which both keys will be changed. Consumers should request new tokens before their existing ones expire to insure uninterrupted access to Service Bus. The service uses a connection string of the Manage policy to get queue description and locate a Read or Write authorization rule. It will then use the rule's primary key to create a SAS token using SharedAccessSignatureTokenProvider.GetSharedAccessSignature method. The POC token service doesn't require any authentication, in real world of course you need to use control access to it. We use MessagingFactory to construct a QueueClient instance as it has an overload accepting a token provider. The sender will keep sending messages until it gets UnauthorizedAccessException which could be due an expired token or due to updated encryption keys in the Read policy. Our POC token service sets expiration period to 60 seconds however my testing showed that tokens start being rejected by Service Bus as expired only in 5-6 minutes. When you rotate encryption keys twice tokens get rejected with error 40103 immediately.